What with him still carrying a fair bit of sway down Naples way, it wasn’t particularly far-fetched that Diego Maradona should turn out for Napoli’s Champions League tie with Bayern Munich in Bavaria t’other night. The only fly in the ointment being that, despite the two watches, two-tone beard, Teflon-coated suit and tight bubble perm, the man the fans were photographing wasn’t actually El Diego at all. Hey Craig…..Where are the Spot the Baller answers from like 2 weeks ago now?? @Davy: They’re always at the bottom of the next in the series. Which one are you looking for specifically? 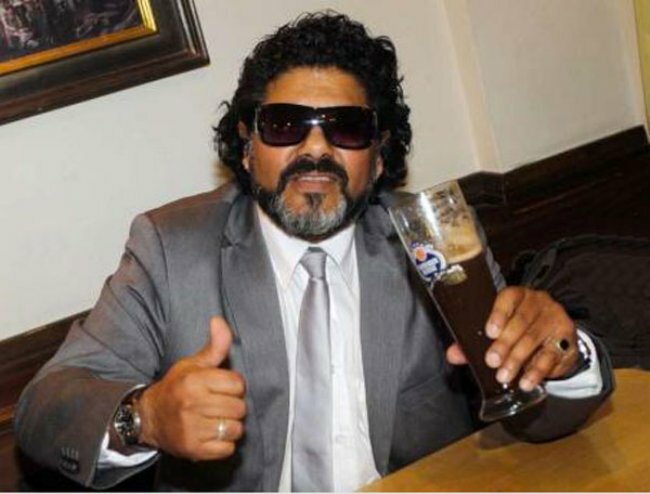 “Professional Maradona lookalike”… How much does a gig like this pay? And what universities offer this major? Don’t seem to remember Maradona being from Iran though. @ Chris It’s ok I found it….Think I was having a numb day!! !